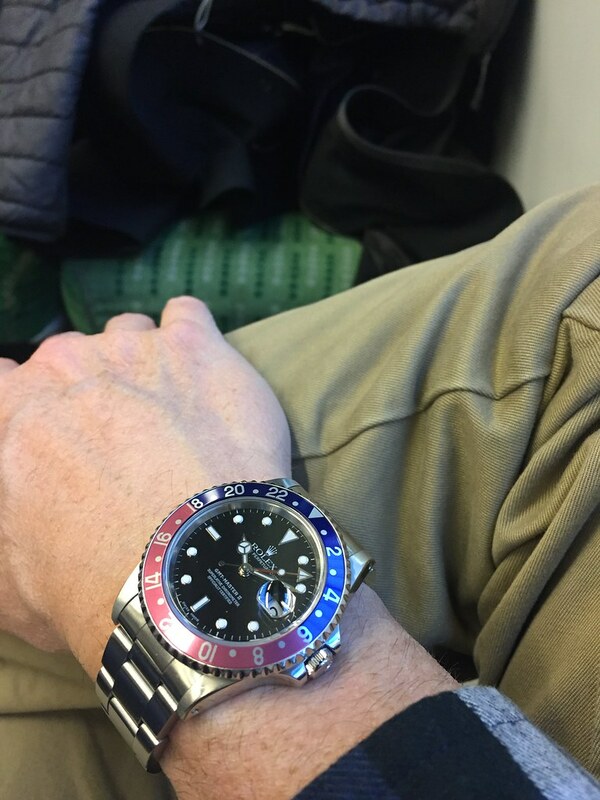 TimeZone : Rolex - Modern » New Rolex GMT II Pepsi or Vintage. Which would you buy? I've wanted a pepsi GMT for years but now I'm getting more serious about a purchase. 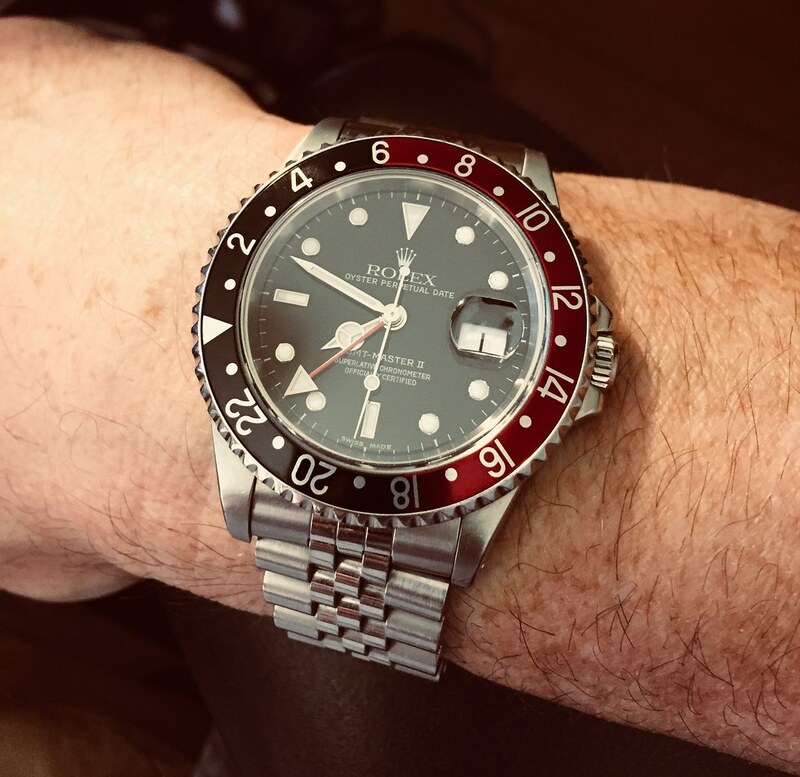 With the arrival of the new ceramic pepsi GMT, I'm now a little torn between the 2 models (not that I could get my hands on a 126710 any time soon!). I think the vintage GMT looks better. I am not a big fan of the new boxy modern font Rolex is using on the bezel and really like the look of the old bezel. However, I am attracted to the new movement and more robust design of current Rolex watches with their improved bracelets and clasps. If I were to opt for the vintage GMT, can anyone recommend their favorite model number and if there are certain models to avoid? Would a later model vintage (2000-2007) be necessarily lower hassle / maintenance than earlier versions? As much as I love the vintage pieces, I am also drawn to the improvements found in the new GMT. Remember that the vintage models were state of the art in their day and someone purchased them to use. I'm planning to do the same when all of the hoopla surrounding the new SS GMT dies down. It can then proceed to "become vintage" on my wrist. There are plenty around. I'd recommend one with a Luminova dial. Mine is an A serial with boxes/papers (full set) that I found locally in December. It gets a lot of wrist time. Pepsi, Coke, jubilee, oyster...it's so versatile. Here's my personal experience with vintage Rolex (and MANY other vintage watches I've owned). I simply don't baby my watches and that takes a real toll on vintage watches. My 5513 Maxi, Omega SM300 (original), etc., started to show wear quickly. They were both serviced by the best in the business, but water intrusion was a real issue. The SM300 was deemed WR but Omega Beinne, but the first wear in the water and intrusion happened. The 5513, scratched the aluminum bezel within a few months. As much as I regret selling the 5513 for it's beauty (and it's current market value), I wouldn't go back to a non-ceramic version for love nor money because my lifestyle would have that watch looks really rough in no time. Lastly, it seems like you are in not in the position or desire to own both, I recommend the new Pepsi. As side note, IMHO, the new bracelets are infinitely better than the old stamped versions. I would prefer the new Pepsi GMT over a vintage model. Even though the vintage models with that beautiful tall acrylic crystal and slender case profile is gorgeous, I want to be able to wear my watches without discretion and not have to worry about babying them. Hence modern for me. Thank you for noticing me! Very nice of you. Yes, it's good to be back and even nicer to reconnect with you guys! +1 regarding what @joeyza just said. color of the ceramic Pepsi bezel. 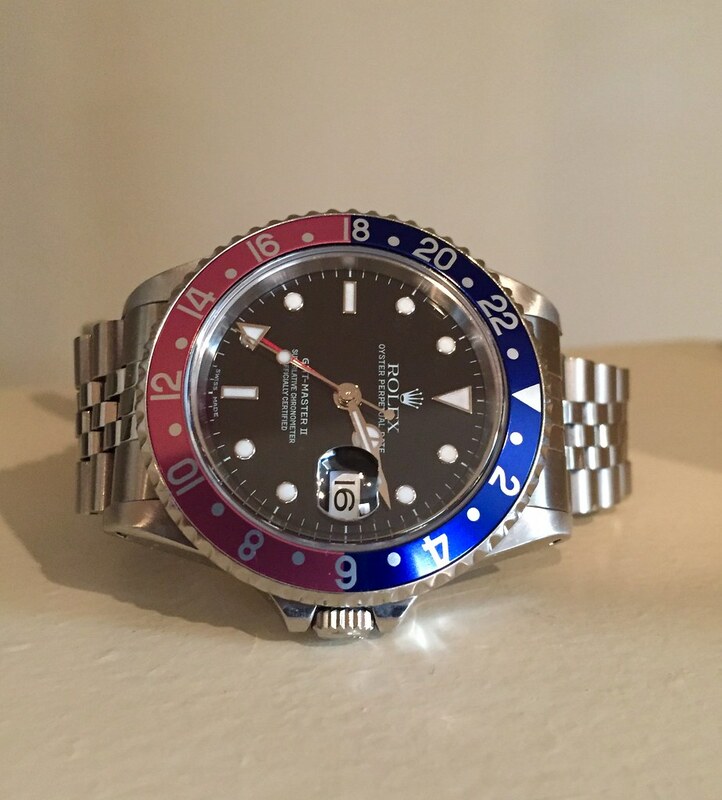 Should be the same blue as the BLNR and a real red. But, vs vintage, on the new Pepsi, I like the new movement, solid center links, solid end links, clasp, ceramic bezel, bezel ceramic bearings.